This photo, which I showed in The Gallery a couple of weeks ago, has just been published in the glossy monthly railway magazine, Heritage Railway. 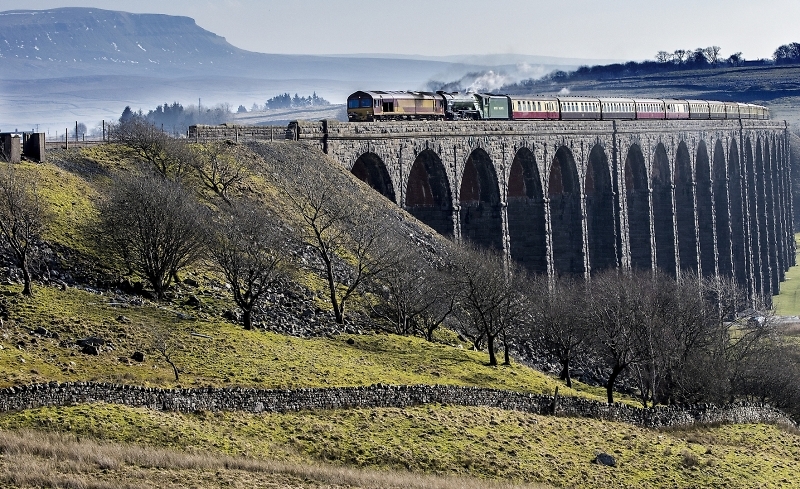 It shows the A1 Class express steam loco Tornado working a heritage charter train bound for Carlisle over Ribblehead Viaduct in the Yorkshire Dales with a Class 66 diesel loco coupled on the front. The appearance of the train with a diesel piloting Tornado upset the hundreds of lineside photographers. Heritage Railway ran my picture with the story of why the diesel was there. Tornado's Train Protection and Warning System had developed a fault so it was decided to put the diesel, which had taken the train from Cambridge to Doncaster earlier in the day, on the front so its driver could observe signals and operate the brakes. Tornado still did must of the work of hauling the heavy train although when the train was accelerated after the viaduct speed restriction I got the impression the diesel was first to open up the throttle. Well done, it is a beautiful photo. It'll cover my coffee and bacon sarnie breaks. Congratulations and well deserved as it is a beautiful capture. Well done David, a delightful image. The Tornado second does make you look doesn't it? A great image - well done that man! Congratulations and well done, David! Congratulations David.. Well deserved, awesome image. Beautiful image, good to see it's getting the deserved praise.